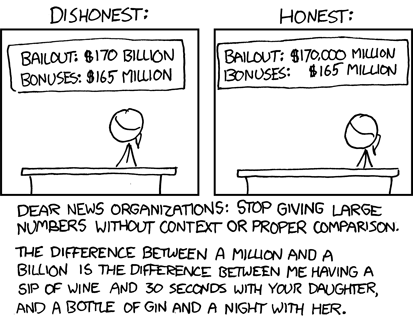 While I’m opinionating, I’ll just say that today’s Xkcd sums up my opinion on the Bailout Bonuses as succinctly as possible. Personally, I’m wondering why people weren’t so outraged at the greater thievery, the Merril-Lynch bonuses ($4 billion) just before they were sold to BoA using $25 billion of our money. Fact is, it will take pitch forks and torches to straighten this out in any semblance of a fair manner. Eh, that won’t work either, but at least it would be fun at the time. Instead of Congress taxing the bonuses away (an action that I find legally questionable) they should insist that the money be spent on services and American products. That *is* what this stimulus is about, after all.